With 60 galleries of art, archaeology and anthropology, this is India's largest museum, India's oldest museum, and quite possibly India's most attractive museum, housed as it is in a stunning, colonnaded palace. 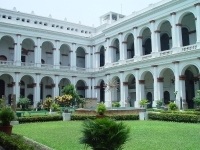 The Indian Museum was established in 1814 and the collection is vast and varied, including fossils, skeletons, coins, manuscripts, all kinds of Indian art and sculpture, traditional games, icons, puppets, toys, musical instruments and much more. The natural history collection is thought to be one of the world's finest and the museum library is famous for its impressive collection. Unfortunately, although there are fascinating things to see and learn in the museum, it is not as well-maintained as it could be, and sometimes the beautiful building seems slightly dilapidated. Nevertheless, a visit here is mandatory for those wanting a snap-shot view of India's past. As the collection is so big it is best to join one of the four guided tours that are available each day. There are restrooms and a simple little gift shop at the museum; there are also usually many hawkers outside the museum selling snacks, souvenirs and trinkets.